In existence since 1887, the Mendocino Volunteer Fire Department is the oldest on the coast. Our dedicated crew of 32 men and women come from all walks of life, and range in age from 20 to 70. All of them share a a genial camaraderie, and derive great satisfaction from the services they provide their community. Weekly training sessions ensure that they stay current with their skills and certifications. They receive up-to-date training in CPR, emergency medicine, hazardous material responses, technical rescues, and of course, the skills required to protect life and property from fire. 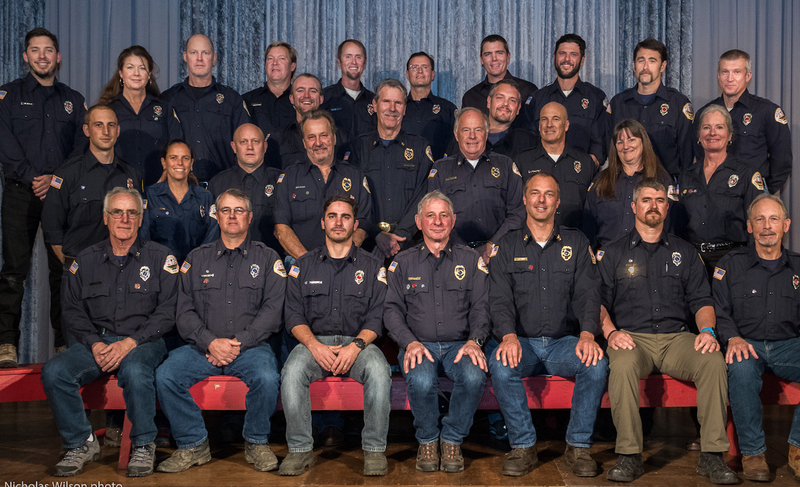 Mendocino Volunteer Fire Department, 2017. Front Row, left to right, Captain John Pisias, Captain David Lindstrom, Captain Paulo Andrade, Asst. Chief Dave Latoof, Asst. Chief Otto Rice, Captain Joaquin Jones, George Dreaper; Middle Row, Tyler Grinberg, Rebecca Morse, Josh Miller, Nick Winegar, Jovan Jelic, Chief Ed O'Brien, Barry Cusick, Tommy Pelletier, Jason Williams, Lisa Burtis, Sally Swan; Top Row, David Puder, Erin Keller, Captain John Paul McMillan, Shawn Dawson, Matt Yager, Dirk Dooley, Russell Hartridge, Tanner Flagg, Patrick Clark, Patrick Pekin; Not Pictured, Asst. Chief Rich Jung, Karin Kamb, Kyle Rodrigues, and Sayre Statham. Anyone interested in becoming a volunteer firefighter is encouraged to attend our regular Wednesday night meeting at the fire house at 7:00 pm. Please take a moment to read our Requirements for Membership. This link will take you to our calendar.